Robin with her new rod! I confess that I made a horrible mistake a few weeks ago. The whole episode started innocently enough, when I decided to loan my Suntech Field Master 39 to my wife, Robin. Forgive me. I just didn’t realize what a blunder I was making and what a tangled path I was heading down. We were fishing the South Llano River near Junction, TX when Robin thought she needed a longer pole to reach a particular spot of water. Normally Robin enjoys using shorter tenkara rods because she says they give her better control. But, on that fateful day, she needed the extra length. The only other rod I had brought with me was my beautiful Field Master. “Here,” I said. “Try this.” What was I thinking? Robin was doubtful at first, but she took it anyway and began to fish. And then she fished and fished some more, landing one stocker rainbow after another. You see, the spot of water she had been trying to reach really was the right spot. The next day she asked if she could “re-borrow” the rod so she could fish the same place. Now right there is where I could have politely declined, but I’m a soft touch. Once again, she out-fished hubby - with my own rod! Talk about embarrassing. 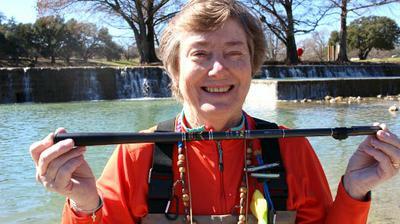 Two weeks later we traveled to Blanco State Park in Blanco, TX, and Robin asked if she could borrow “her” rod again. Wait a minute . . . When did my rod become HERS? To make matters worse, she landed an unseemly number of channel catfish that day. Turns out that Field Masters and channel catfish go together like ketchup and fries. Oh, why did that Suntech rod have to work so well? The handwriting was on the wall, and the news wasn’t good for yours truly. So, I decided to make the best of a bad situation and “gift” her with the Field Master 39. Hey, I was only acknowledging the painfully obvious. At least I had an excuse to order another rod from Chris Stewart, while Robin smiled sweetly and looked the other way. So please don’t loan out your rod. Chances are, you won’t get it back. Oh, no! To preserve matrimonial harmony, it is absolutely critical that you loan your rod to your spouse! Besides that generally means you will be able to buy that new one you had your eye on anyway! I will not let a family member fish with one of my Suntech rods. That is why I have two other brands from Chris! Good thing as I am planning on sticking to that wonderful brand for most of my future purchases. Speaking of purchases, I bought a different brand of Mummy Worms to check out, stick with the one's from Chris! The ones I bought were not uniform in size, and they were a bit more expensive. Oh, the lessons we learn in life! Robin pointed out that I'm lucky to have a wife who likes to fish . . .
Been there, and done that, John! And Chris can confirm that; can't you, Chris? Ha! All part of the fun of having a fishing partner who shares the years and the fishing with you. Wouldn't have it any other way! Dave, as soon as I read John's submission (or perhaps as soon as I read of his submission) I thought of you. Guys, I'm not sure Dave has been able to keep any of his rods - except when he buys a second one after the first one gets "borrowed." So just accept it. It is a fact of life and not one worth fighting (you wouldn't win anyway). If it keeps your best fishing partner happy, it's worth it. Words to live by: "Happy wife, happy life." A hearty "AMEN" to that, Chris!! But when your wife thinks that a "six-pack" of mummy worms are the best Valentine's Day gift ever, happiness is never in short supply. Double up on the rod purchases, y'all; you'll never have to explain why another rod is coming through the door! Ha!